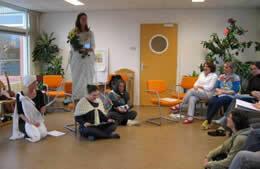 This spring the Teachers Training in Holland was held at two schools separately and simultaneously, one in Den Bosch and one in Hoorn. 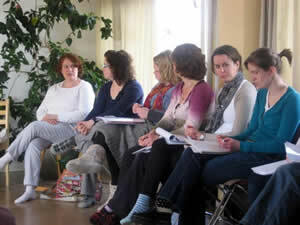 In the Zonnelicht School in Den Bosch 27 teachers attended the three day seminar with the focus on Neohumanism. A teacher who had taught for eight years, the longest of any teacher, commented that this was a very welcome topic delving deeper into the philosophy while previous trainings have been more focused on methodology and teaching skills. In light of Neohumanism, the first day focused on the human being, the second on the teacher and the third on the school community and society. On the first day Dada Pranakrsnanda presented the Brahmacakra or the wheel of consciousness, the evolutionary theory applied in Neohumanist Education. He focused on the interplay of inseparable consciousness and energy. Energy makes consciousness into the world of the five elements and out of the densest form of consciousness life emerges and evolves into various life forms. The wheel is turning from subtle consciousness to crude and from crude to pure consciousness again. The key is to be centered in consciousness while the energy is dancing just like a boat has to keep the flow of the propeller and motor steadily going while the storm is raging. We are part of the mind and body of God or consciousness. We are coming out of the humanized God by being conscious ourselves. We as individuals are microcosms of the macrocosm. At various stages we are dominated by instinct, intellect or intuition as we go through our own experiences on the evolutionary journey towards returning ‘home’ to where we came from. 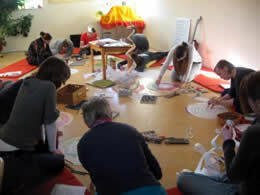 The thread of the human being was carried into the afternoon programme by Didi Anandarama who led a discussion and games on the nature of human beings treading the path of harmony with the world and with oneself while moving on the circle of creation towards the goal of life, the attainment of pure consciousness. For one of the games we had cards made of the description of the 10 principles of Ya ma and Niyama as they are found on the Yama and Niyama poster. Each participant had a card and had to find their partner who had a description of the same principle. For another activity groups of 3 or 4 people were given 3 cards with different principles and they prepared a demonstration of how to apply them with children. In the evening we watched a beautiful PowerPoint presentation of the Brahmacakra Cycle in Dutch followed by videos of various NHE schools including one in Russia. The teachers were inspired by this, feeling part of a greater network of schools, seeing the many varieties of application of the same philosophy. It was distinctly noticed that P.R. Sarkar put emphasis on the human qualifications above the academic or acquired certification of the teacher. 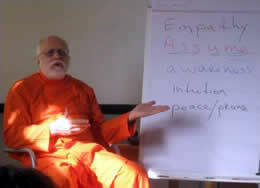 This was followed by a presentation by Didi Ananda Devapriya on “Holistic Self-Development for Teachers”. Please see separate article on this presentation in this issue. The afternoon featured a discussion, in two small groups, of how to communicate observations of a child to the parents followed by role plays under the guidance of Ole Brekke, drama expert and educator. 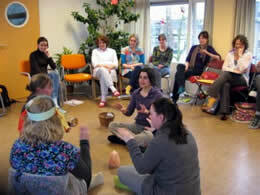 Small groups of teachers prepared real life situations between teacher, child and parent and related psychological approaches for the welfare of all. In the evening there was a cultural programme prepared by the teachers involving all in lively folk dancing including a dance presentation by a teacher from Eritrea. This event loosened up everyone and a suggestion was made for the next Teacher’s Training to have this programme at the beginning of the seminar as an ice-breaker. 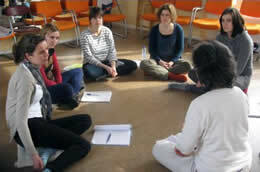 The teachers training closed with sharing of Circle Time activities in two age groups and final evaluation and closing. Teachers expressed that this was the best Teacher’s Training as they felt a strong bonding with each other since they were together as a team from the same school. They also liked the meaningful thread that was holding together the seminar which helped them to go deeper into the concept of Neohumanism.